This is the final part of a three part series. You can read part 1 here, and part 2 here. Human Rights activists invested a lot in the Geneva process, and the Government invested a lot in blocking them. 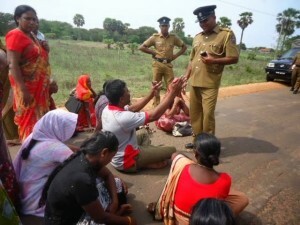 In the first two parts of this article we have argued that the September session of the Human Rights Council is unlikely to fully meet the need for accountability in Sri Lanka, but that nevertheless it can be used to set in motion a process that could eventually bring about the sort of internationalised transitional justice process that victims demand and require. In the meantime war criminals walk free in Sri Lanka, a fact that continues to damage the rule of law, trust between communities, and hopes of a lasting peace. States which are supportive of the idea of accountability in Sri Lanka therefore need to understand that their commitment to accountability cannot simply be limited to their approach to the Human Rights Council. They need to use every means at their disposal to end Sri Lanka’s culture of impunity. Will they now consider prosecutions under universal jurisdiction, travel bans, asset seizures or targeted sanctions against culpable parts of the Sri Lankan state (the army, TID, CID) or individuals in command positions when war crimes took place? Will they arrest former LTTE commanders living in their jurisdiction? Will the United States prioritise the prosecution of United States Citizens and Permanent Residents: such as Gotabaya Rajapaska, Basil Rajapaska, and Sarath Fonseka under United States law? Will the findings of the OISL report bear on decisions to grant licences for arms exports to Sri Lanka? Will they push for the UN to vet Sri Lankan peacekeeping troops? Given demonstrated ongoing torture in Sri Lanka, will they change their guidelines for asylum seekers and acknowledge the link between asylum and witness protection? A sustainable peace in Sri Lanka requires the demands of the survivors on both sides of Sri Lanka’s civil war be met. Those demands are for truth and justice in the first instance; followed by acknowledgement, apology, guarantees of non-recurrence, institutional reform, a political solution to Tamil grievances, and reparations. The international community and the Sri Lankan Government must both work to ensure that, as a starting point, the demand for truth is met. The release of the OISL report should present a unique moment in which the first meaningful steps towards that goal might be taken. With regards to justice however, the weak desire of the international community to demand it and the unwillingness of the Sri Lankan government to provide it, suggests the need for a more determined and sustained strategy. Public pressure (both international and domestic) will continue to be essential, as will the establishment of an ongoing UN monitoring system. Those states most supportive of accountability in Sri Lanka must also be encouraged to pick up the mantle as we continue to wait for a strong international process, for example, by pursuing bilateral prosecutions and sanctions. Taken together, these measures will help improve the chances of securing meaningful international justice for victims in the years to come. Meanwhile, the Government of Sri Lanka must be reminded that grandiose yet meaningless gestures on reconciliation are not helpful and that a reconciliation process cannot be imposed from above upon an uninterested population. It is vital that the international community clearly understand that their responsibilities with respect to human rights in Sri Lanka extend beyond merely voting the right way in the Human Rights Council. It is concrete actions that really matter.